Immortalized by his poems Those Winter Sundays; A Ballad of Remembrance; Runagate Runagate; The Night-Blooming Cereus; On Lookout Mountain; Frederick Douglass and El-Hajj Malik El-Shabazz — all of which have taken their rightful places “among the masterpieces of modern American poetry“ — Robert Hayden (1913–1980) has emerged as one of the most important American poets of modern times. 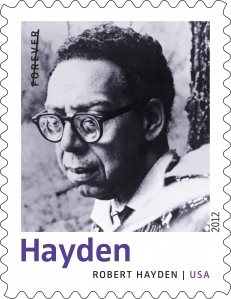 On April 21, 2012, the United States Postal Service honored Hayden as an American literary giant, one of ten of America’s most illustrious 20th century poets featured on 45-cent First-Class Mail Forever stamps. However, “[American Journal]“ (1976), as the country’s Bicentennial poem, did not achieve the acclaim or the scholarship of Hayden’s other work. Unsurprisingly, critics still tend to typecast Hayden as primarily as an African-American poet, best-known for his earlier signature poems. Quite naturally, Hayden’s primary audience relates to those poems that address racial issues more directly and fully. Yes, this poem describes America. But, really, “America” stands for the world. The same poem could be adapted to other countries, with just a few alterations. The result is an imaginative and provocative commentary on American society — and, by extension, a commentary on how us earth-bound humans relate to each other. And, much to the reader’s surprise, Hayden dispenses with his human identity altogether, writing as an alien (probably from Mars, based on a line in his poem). In the poem, this alien can “shape-shift” and assume various human identities. That unusual device allows Hayden’s Bicentennial poem to view the human race from a universal perspective rather than from a racial (and thus bracketed) vantage point. However, the poem also sees humanity through a nationalistic portal, namely that of “the americans”. 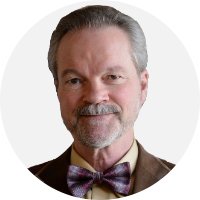 Thus “[American Journal]“ operates on two planes: narrowly, as an observation of America itself, and, broadly, as a social commentary on the world. In this way, the poem questions the myth of the American Dream, allowing Hayden to explore the metaphysical paradox of America. Thus “[American Journal]” really centers on a character study of the national character. Throughout the 115 lines of the poem, Hayden develops a profile of the American character by exploring various facets of American identity. In sketching out the American physical and social landscape and its peoples, the poem’s “Martian observer” creates a social portrait of America in several dimensions. 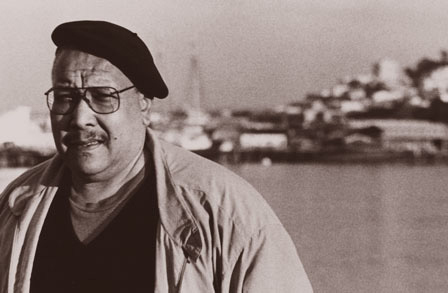 Hayden’s acclaim as “America’s Bicentennial Poet Laureate” celebrates the deep meaning of his poetry – in fact, ten years earlier, Hayden was honored as the Poet Laureate of Senegal! Robert Hayden’s ‘[American Journal]’: A Multidimensional Analysis. See also: Christopher Buck, “Robert Hayden.” Oxford Encyclopedia of American Literature. He is such a great poet. I have read many of his poems. USPS honored him by releasing a stamp on him. Now USPS is offering all services under Liteblue. Login USPS and enjoy all postal services.